Amy, my wife wouldn't let me do a mile in the airport in Minnesota during our layover, so I only got to run in two new states. 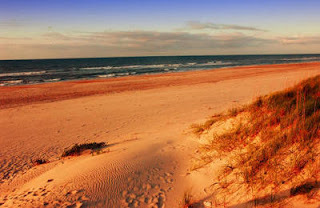 My first run was in North Carolina - The Outer Banks or OBX, as the locals call it. Our hotel was on the beach about a 1/4 mile away from the Wright Brothers Memorial, so my plan was to run over to the memorial. 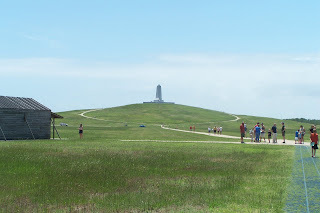 Here I am pictured next to the memorial that is situated on a hill overlooking the field that was used for the first powered flight. Here you can see the hill. It was a big hill, the picture doesn't do it justice. It was a large sand dune back when the brothers were here. The park service planted grass to keep it stable. I ended up running 2.75 miles in about 45 minutes. I did take some time on the top of the hill to snap some pictures and to take in the view. Once, I was below I finished touring the museum. We visited the day before and did about 75% of the musuem. I wanted to see it all. In the picture below you can see four markers in the distance. The Wright brothers took turns flying the plane. The first flight lasted 12 seconds and went to the first marker 100 feet away. The second and third flights went 175 and 200 feet. The final flight of the day lasted for 59 seconds and went over 800 feet. I took the challenge and decided that part of my run would be to the last marker. It took me about an additional 10 seconds to reach it. I then ran back to the hotel, grabbed my bathing suit and found my kids at the beach for some body surfing. I didn't get to run as much as I'd like. I wanted to do a beach run, but that didn't happen. After spending a few days at OBX in North Carolina, taking in a wedding and a family reunion. My family headed toward Virginia to take in some Revolutionary and Colonial history. Grandpa Harry Potter came along for the fun. Yeah, I married Harry Potter's daughter. 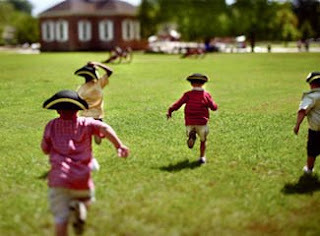 We visited Yorktown, VA the sight of the battle that won the Revolutionary War and gave us our independence. I saw runners running the roads in the battlefield, pretty cool. 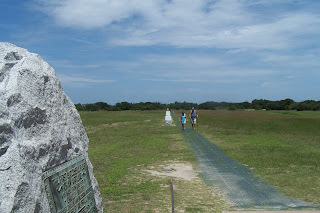 We went to Jamestown, VA, the first English settlement in the new world. Think Pocahontas. The driving tour was on an island and it too would have been a great place for a run. We stayed in Williamsburg, VA and visited Colonial Williamsburg the site of the Governor's Palace when the King picked the govenor and the Colonial Capitol where Thomas Jefferson and Patrick Henry made their names. All three places were unbelievable. If you are a history buff, it's a must see place. 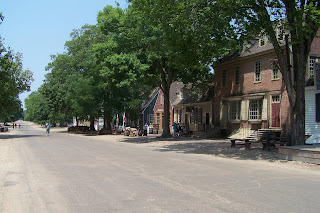 I decided to run in Colonial Williamsburg, down the DOG or Duke of Glouchester Street in the heart of the oldest part of town, past the Gov's palace and the Capitol and then onto the campus of William and Mary College. 2.51 miles and 234 years in the past. It was beautiful. So, that gives me 7 states that I have run in to date. You can see the map on the right of my blog. the Kitty Hawk area. I have not run on a beach yet, so this will be a first. NC will also be a new state for me to run in. # 6 on my list. Lately I've been running about 1-2 a week, not much. It's too hot in the day to run here in Arizona. I hate getting up to run in the morning, so that leaves me the evenings. After the wedding, reunion and visiting Kitty Hawk we'll be taking a road trip north to see Williamsburg, VA and I plan to run there too. Not as fast as the kids in the photo and without the tri tip hat, but run none the less. I hope to be able to run down the historic streets. It's a four mile round trip from our hotel. That's almost perfect for me these days. Of course, Virginia will be state #7. You can look at the map on the top right to see the other states I've run in. To date, those are all my goals for running. 1. Run in NC. 2. Run in VA. I think I need some more goals.